Lin Yan, Embracing Stillness, 2013, site-specific installation, charcoal drawing and Xuan paper, 276 x 192.1 x 118 in. 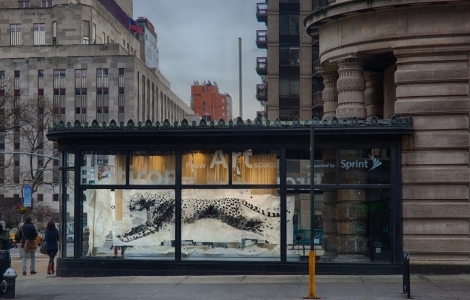 (700 x 488 x 300 cm), ©Lin Yan, Courtesy Flatiron Prow Art Space and Cheryl McGinnis Projects, New York. 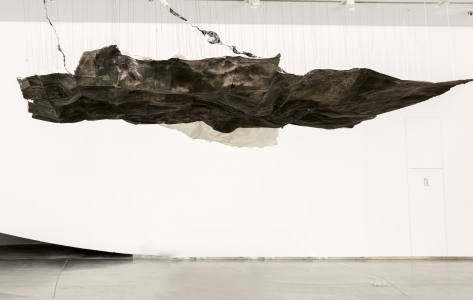 Lin Yan, Gateway, 2017, site-specific installation, ink and Xuan paper, 122 x 48 in. (310 x 122 cm), Photo: Eugene Neduv ©Lin Yan, Courtesy Fou Gallery. 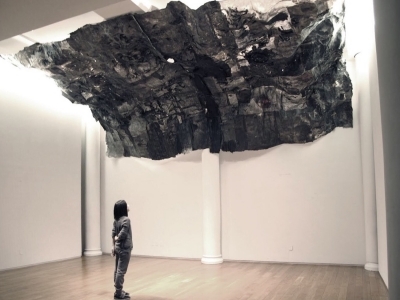 Lin Yan, Sky, 2013, site-specific installation, ink and Xuan paper, 150 x 165 x 197 in. (381 x 420 x 500 cm), ©Lin Yan, Courtesy Yuan Art Museum, Beijing. Lin Yan, Dubhe (Tianshu 天枢), 2017, site-specific installation, Xuan paper, ink, and LED lights, dimensions variable., ©Lin Yan, courtesy Museum of Contemporary Art Yinchuan. 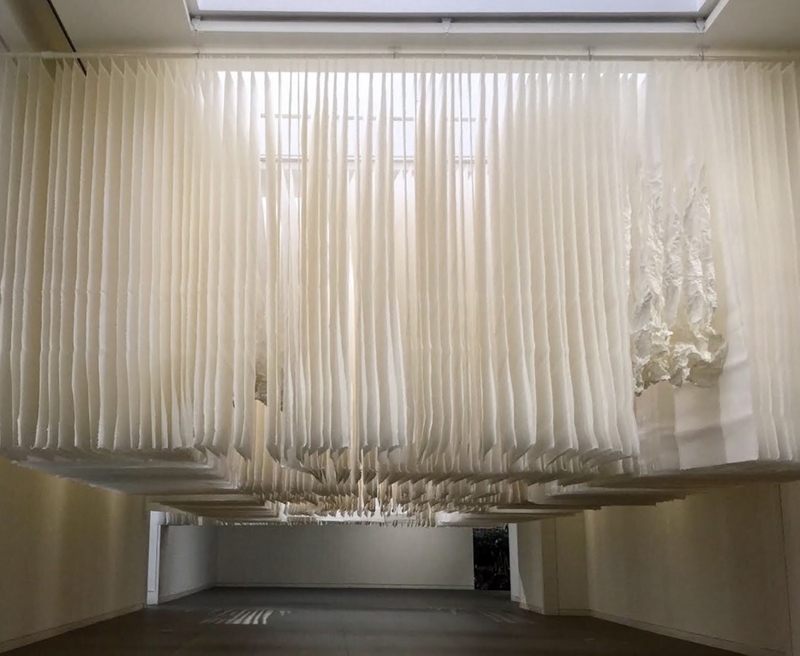 Lin Yan, Phecda, 2017, Site-specific installation, Xuan paper, dimensions variable, ©Lin Yan, courtesy Wanying Art Museum, Shijiazhuang. Lin Yan, Inhale, 2014, ink, Xuan paper and LED light, 30 x 13 x 6 ft. (910 x 396 x 182 cm), Photograph by Jiaxi Yang. ©Lin Yan, Courtesy Tenri Cultural Institute and Fou Gallery. 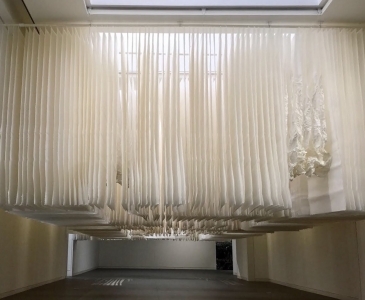 Lin Yan, Sky 2, 2016, Site-specific installation, Xuan paper and ink, dimensions variable, ©Lin Yan, courtesy White Rabbit Art Museum, Sydney. 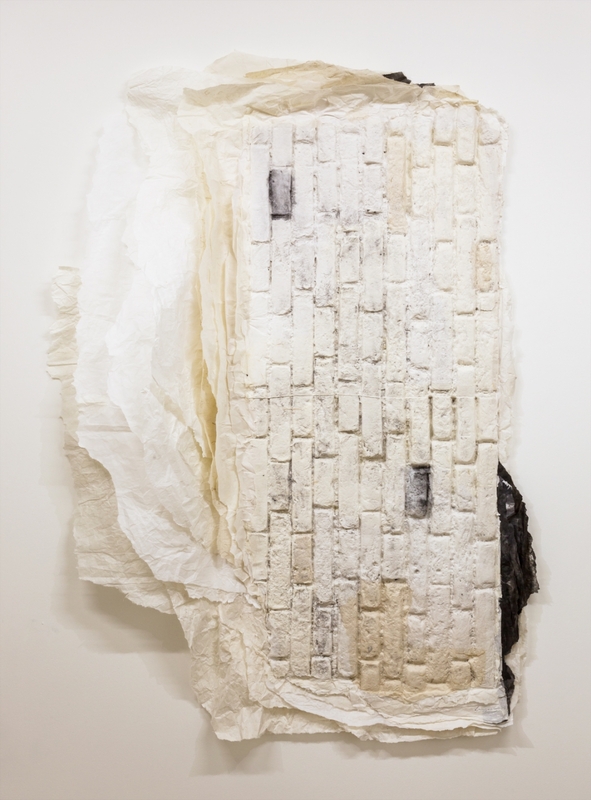 Known for her practice involving Xuan paper, Lin Yan (b. 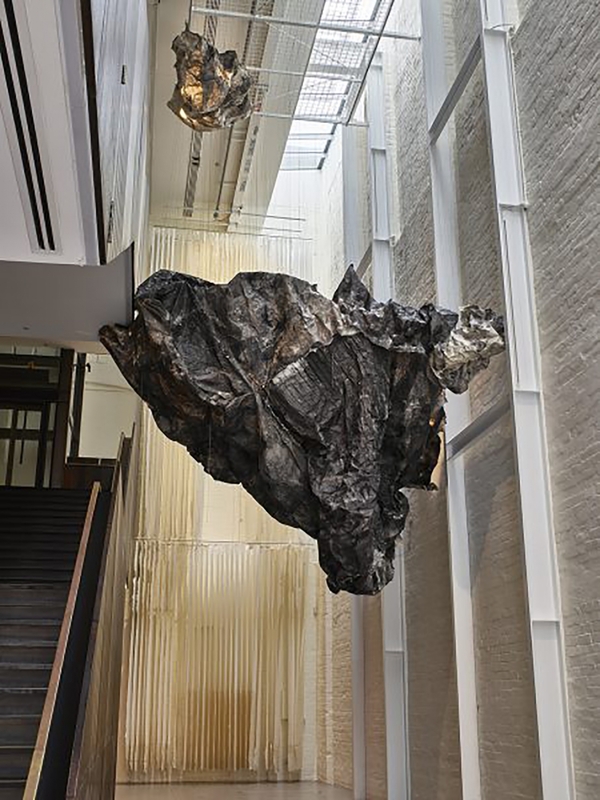 1961, Beijing) creates site-specific installations that respond to her surrounding environment and architecture. A type of traditional, hand-made paper conventionally used for painting and calligraphy, Lin’s works with Xuan paper have been included in museum and gallery exhibitions worldwide. Responding to the demolition of Beijing’s historic buildings and districts after her return to Beijing in 1994, Lin began to cast surfaces of old buildings in Beijing in Xuan paper, attempting to preserve traditional architectural features, such as roof tiles and rivets, after their demolition. Lin was originally trained as an oil painter; by 2005, Xuan paper became the main medium used in her practice. Creating sculptural paper works with soft, crumbled layers of paper, her work meditates on the tranquility of her chosen medium. Many of her works also include the use of dark, black ink, often negotiating the contrasts between black and white, hard and soft, as well as darkness and light. Since 2013, Lin Yan has been doing site-specific installations in public art spaces and alternative art spaces, in response to the specific architectural characters. 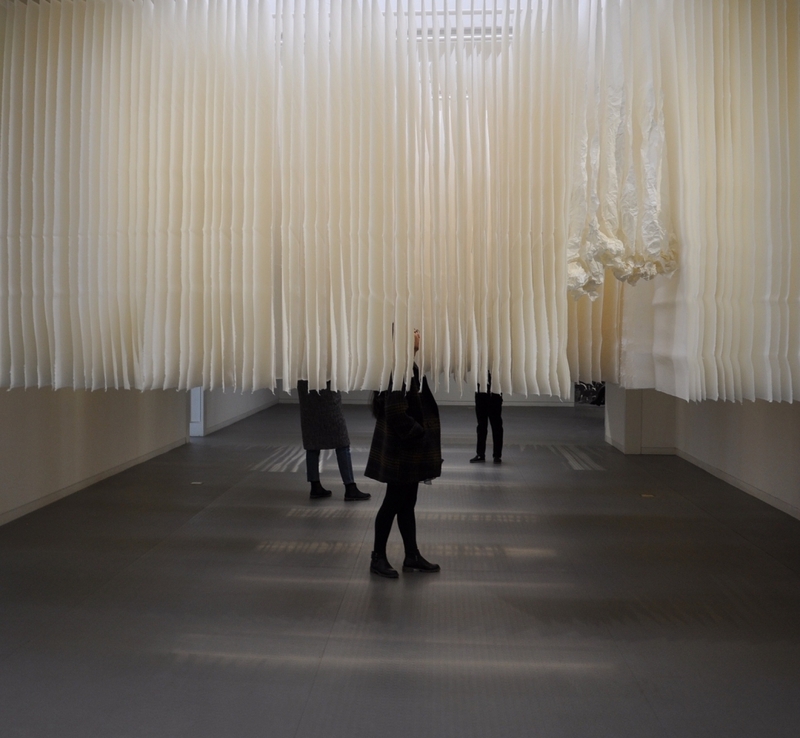 Significant installations include Embracing Stillness (2013) at the Flatiron Prow Art Space (New York), Sky (2014) at Yuan Art Museum (Beijing) and the Tenri Culture Institute (New York), as well as Sky 2 (2017) at White Rabbit, Sydney. In 2017, Lin embarked on a public art project series, entitled Regeneration of Hope. Each of the site-specific installations are named after the seven stars of The Big Dipper; within Chinese astronomy, the Big Dipper is often regarded as the symbol for direction. 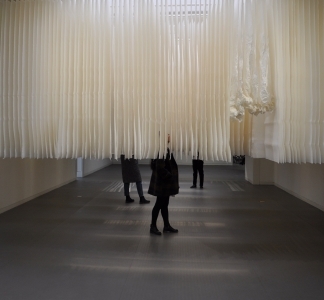 So far, Lin Yan has been created Dubhe (Tianshu) at Yinchuan Museum of Contemporary Art (Yinchuan, China), Merak (Tianxuan) at Jinji Lake Art Museum (Suzhou, China) and Phekda (Tianji) at Wanying Museum (Shijiazhuang, China). Lin Yan graduated from the Central Academy of Fine Arts, Beijing, and pursued her further studies at L'École Nationale Supérieure des Beaux-Arts, Paris, as well as the Bloomsburg University of Pennsylvania. 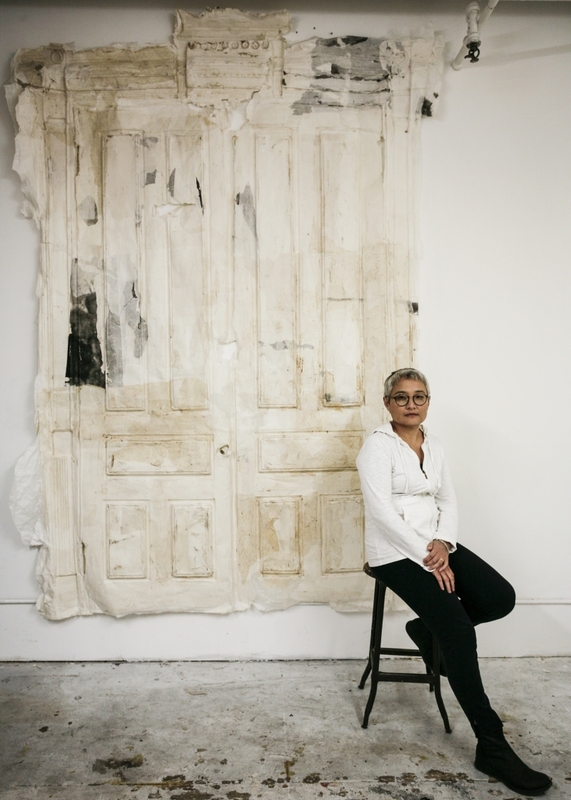 Her work is included in the permanent collections of many public institutions such as Chengdu Contemporary Art Museum, Deutsche Bank Art Corporate Citizenship (New York), Museum of Central Academy of Fine Arts (Beijing), National Museum of China (Beijing), Long Museum (Shanghai), and White Rabbit Gallery (Sydney), among others. Biography image: Lin Yan at studio, with work Gateway, casted from the gate of a classic Brooklyn brownstone. Gateway, 122 x 48 in., Xuan paper and ink, 2017. Photograph by Eugene Neduv ©Lin Yan, courtesy Fou Gallery.